New Haven, Conn. – Imagine being able to hear people whispering in the next room, while the raucous party in your own room is inaudible to the whisperers. Yale researchers have found a way to do just that — make sound flow in one direction — within a fundamental technology found in everything from cell phones to gravitational wave detectors. What’s more, the researchers have used the same idea to control the flow of heat in one direction. 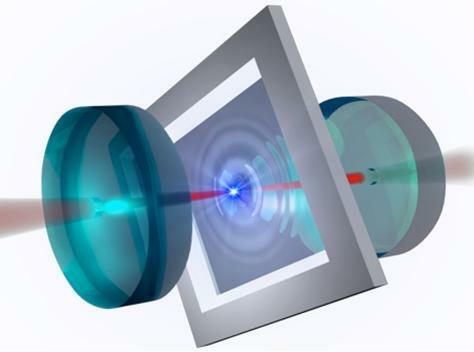 The discovery offers new possibilities for enhancing electronic devices that use acoustic resonators. The findings, from the lab of Yale’s Jack Harris, are published in the April 4 online edition of the journal Nature. Harris said his team was able to achieve the result with a “tuning knob” — a laser setting, actually — that can weaken or strengthen a sound wave, depending on the sound wave’s direction. Although some of the most basic examples of acoustic resonators are found in musical instruments or even automobile exhaust pipes, they’re also found in a variety of electronics. They are used as sensors, filters, and transducers because of their compatibility with a wide range of materials, frequencies, and fabrication processes. The work is supported by the Air Force Office of Scientific Research, the Office of Naval Research, and the Simons Foundation.